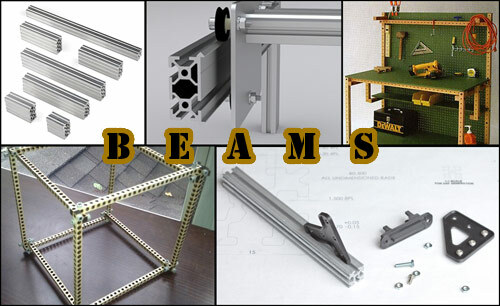 Beam systems make construction of thing easy, or precise, or both. I keep seeing more of these systems, so I figured I’d write-up the ones I’ve seen. Bart from buildlog.net launched MakerSlide, which is an “Open Source Linear Bearing System” geared towards DIY CNC machines like laser cutters, CNC routers, and (now) 3D printers. MakerSlide launched as a Kickstarter project, and did quite well. It seemed to be continually out-of-stock, but Inventibles is now kicking in to fill the gap. There’s a whole system of parts that go with MakerSlide, and from what I can tell it’s a pretty solid system. There’s a new one, called OpenBeam, which is running on Kickstarter as of my writing this. It’s an open source miniature construction system. (See a trend here?) OpenBeam seems to cite that the fasteners and connecting plates used by other systems are what causes things to get costly. Their solution is to use standard sizes and common hardware to make the whole system easier and cheaper to work with. There doesn’t seem to be a web site yet, but you can check out the developers blog. A bit different is how I’d describe Bitbeam. Instead of extruded aluminum like the other systems, it’s typically made of wood, and describe as just “holes in poles.” :) In fact, Bitbeam is based on another system, Grid Beam. And hey, both are open source! Bitbeam is Lego Technic compatible, and you can make your own with a (powerful) laser cutter. Bitbeam is also on Thingiverse. Sweet! Are there any other beam building systems I’ve missed?